Good morning ladies and gentlemen. Welcome to Birmingham and thank you for joining us for the 2019 National Walking Summit. You might at first glance think that Birmingham – for decades known the world over as a motor city – is an odd location for this event. But we’re working hard to change that old perception – not just in this city, but across the whole West Midlands region. We’re working collaboratively to reduce our over-reliance on cars by getting more people onto public transport, more people cycling and of course more people walking. Clearly I don’t have to sell the benefits of walking to this audience, but there are many compelling reasons for doing this. Air quality across this region is poor. Congestion is a key concern. Levels of obesity are rising. And there is overdependence on cars for short journeys. As if those factors weren’t enough, there is another pressing reason why Birmingham must get more people out of their cars: This is a rapidly growing city. We’ll have 150,000 more residents by 2031 and that means potentially 80,000 more cars on our roads and 200,000 more daily trips. The increased traffic would have a staggering impact on people across this city and that was one of the major factors four years ago, when we launched Birmingham Connected – an ambitious strategy for delivering a transport network to support the city’s expansion. 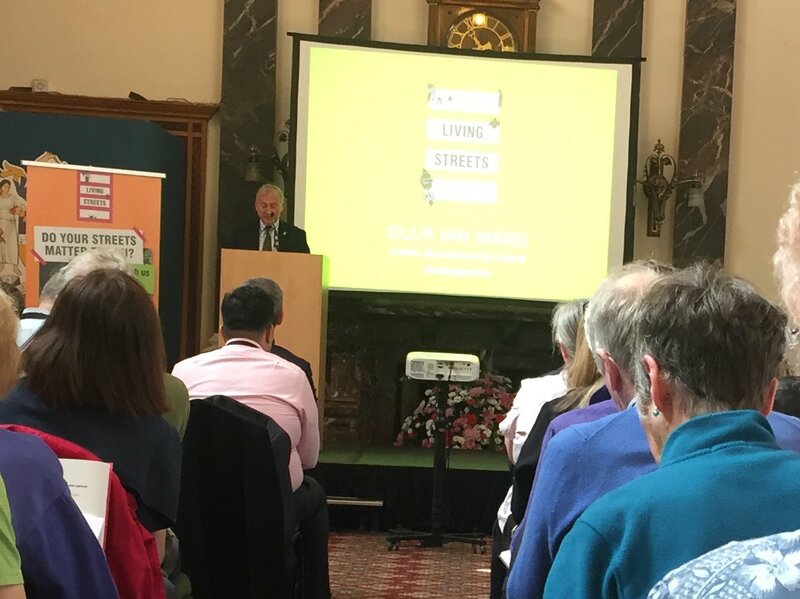 The case for active travel is a strong one and, though we know the journey will not always be straightforward, we know that increasing the levels of walking and cycling is an essential part of making Birmingham ’well-connected’. In the 1960 cities were designed for cars, with pedestrians given secondary status and quite literally driven underground onto underpasses. That is changing and – as our city evolves – we’re working with planners to turn the ‘car first’ philosophy on its head. And we’re not starting from scratch. Birmingham already has a surprisingly varied and extensive network of paths, pavements, towpaths and tracks connecting people with places to live, work and enjoy. There is considerable scope to improve this network by making it easier, safer and better-connected so that more people will choose to walk and cycle, regardless of age, gender, fitness level or income. We’re currently putting the finishing touches to the Birmingham Walking and Cycling Strategy, which will set out a long-term plan to ensure that active travel becomes the popular choice for short journeys and to increase the opportunities for recreational cycling and walking. Develop a great city for walking and cycling – improving infrastructure: paths, parking and public transport. And we must promote and inspire walking and cycling – organising events, distributing information and evaluating outcomes. Success will not be achieved overnight, but by working with partners (locally and nationally) and by engaging with our communities, we have a real opportunity. Increasing the levels of active travel will deliver huge benefits, for individuals and the wider community – with more inclusive growth; better health and safer travel; cleaner air; improved access to jobs, skills and services and more liveable communities. Today’s summit is another step on a journey that will transform Birmingham from the Motor City into an inviting and walkable 21st Century destination. Posted on March 29, 2019, in speech. Bookmark the permalink. 1 Comment. This is a great plan but if you want to people to walk/ cycle you need to improve lighting on the pavements and if possible on the canal towpaths. I use the towpaths from the spring to the autumn for cycling to work but in the winter its too dark and feels very unsafe. You can not under estimate that feeling of being safe.